In this Artanis Build Guide, we provide an overview of his strengths, abilities and talents. Artanis is a challenging Warrior to play that relies massively on not only the damage of his team around him, but also the ability to finish fights once they've started. His reliance on shielding, combined with his lack of mobility, often means that once Artanis is comitted to a fight, he's there until it ends - whether in his favor or not. This often places Artanis in a difficult position, as if his team don't have the damage to follow up, most fights will end badly. If they do have the damage however, Artanis can act as an amazing sponge that can often survive huge amounts of pressure. I must stress that Artanis is often best as an additional Warrior, rather than solo, simply because he has to rely on his team so much if he's "tanking" by himself. Shield Overload (Trait) - Artanis' Trait allows him to gain an amount of shielding when he takes damage below 75% health. During the active shielding, if he uses basic attacks he'll reduce its cooldown by a maximum of 4 seconds. 1 on 1 it's an incredibly strong talent and allows you to survive against most Heroes (besides The Butcher or Kerrigan). Just be conscious of your health pool and if you are engaging when low, try to do so when you know your shield will trigger. The key to really maximizing Shield Overload is to constantly use your basic attacks to significantly reduce its cooldown. Blade Dash (Q) - Blade Dash is a difficult ability to use effectively because its dash forward can actually leave you incredibly vulnerable. If you get caught by crowd control, you're going to take a huge amount of damage with no ability to get back to your allies. When talented it can deal a lot of damage and if possible, try to use it so you'll hit multiple targets instead of just one. Be aware that the initial dash deals less damage than when you return and if necessary, use Blade Dash to avoid high impact damage skills such as Jaina's Blizzard. Blade Dash will also further reduce your Shield Overload cooldown by 1 seconds for every enemy Hero you hit (and 2 for Heroes). Finally, what makes Blade Dash and Phase Prism so potent on Artanis is the fact you can use both at the same time. Effectively, you dash one way, fire Phase Prism out, and gain increased range on pulling someone (in the swap). This not only pulls someone caught massively out of position, but pretty much ensures they're so deep next to you team they can't make it back. Phase Prism (E) - Phase Prism is one of my favorite abilities in the game and despite its short range, it's incredibly powerful. Effectively a "swap", you switch places with any Hero caught by it. If you can tag a healer or squishy target such, it's incredibly easy to trap and burst them down (especially in small fighting spaces). As also noted above, it's imperative you learn how to use it with Blade Dash so that you can take players out of a fight, or pull them miles out of position. Just try not to miss - its cooldown at 16 seconds is very long. Twin Blades (W) - Twin Blades is Artanis' burst ability and allows him to charge forwards (only a little) and instantly attack twice with basic attacks. It's a good way of adding some high damage output in a short window, allowing you to really focus on a player after using Blade Dash. The best part of it however is that it not only triggers two basic attacks (that lower your Trait's cooldown) but it also provides a small charge when you get near to a player, allowing you to close the gap even if you aren't quite close enough. Purifier Beam (R) - One of two Heroic abilities, Purifier Beam casts a slow moving beam of light down onto a single enemy target. It will continue to chase that target for 8 seconds. In some ways it's a strange Heroic because it can be avoided incredibly easy but it's primary purpose is to remove a player from the fight. Unless they retreat or move, they'll take huge damage. Try to always cast it on a high value target such as a support Hero so they're zoned out of a fight. Suppression Pulse (R) - Perhaps a little underrated, Suppression Pulse is surprisingly useful. Timed correctly, it provides a nice little burst of AOE damage but also blinds enemies for a lengthy period of time. It's great for mitigating damage as it prevents all basic attack damage for 4 seconds. Combined with its unlimited range, you can use it on your way to a team fight or if you see a team-mate in trouble and caught out of position. 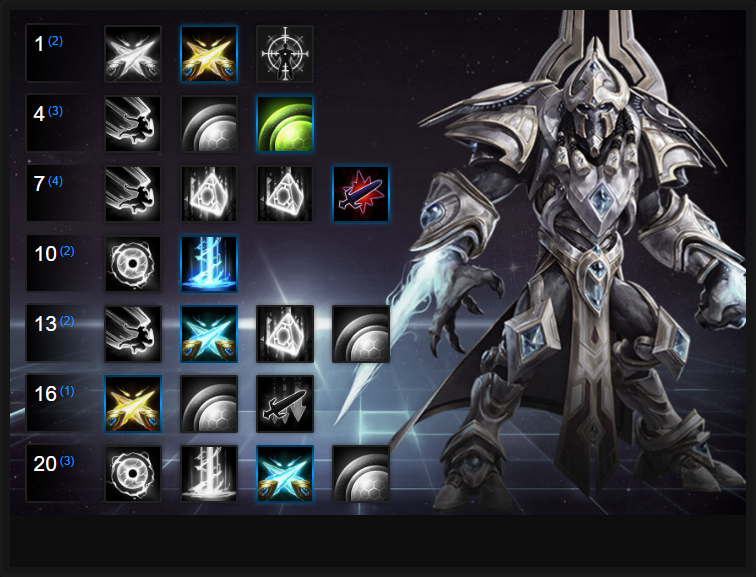 Like our Artanis build guide? You can help support its updates by subscribing to Ten Ton Hammer. Here's the details. Amateur Opponent simply allows Twin Blades to deal 150% more damage against Non-Heroes. For clearing camps, laning, or bringing a boss down, it ensures Artanis deals very high burst damage so can clear them quickly. Variable: A solid variable from a bad bunch, Reactive Parry and provides Artanis with some much needed mitigation. Reactive Parry allows you to block two basic attacks when you trigger Twin Blades. Considering the short cooldown on Twin Blades, it's incredibly useful for mitigating incoming damage. When below 25% health, the value of Artanis' shield is increased by almost 75%. That's pretty ridiculous and affords him an incredible amount of sustain. Shield Surge really is a must for prolonged fights. Building on your use of Twin Blades, Follow Through allows you to deal 40% additional basic attack damage after each ability. For extra burst, an when using your rotation (Phase Prism > Basic > Twin Blades > Basic) against a Hero, it can add up to some serious damage. Variable: Warp Sickness is a great talent if you're after control, as it causes a 35% slow for 4 seconds. It's invaluable for allowing you and your team to bring down a Hero once they've had their place switched. For zoning an enemy player, or locking one down that's slowed from Warp Sickness (if you took it), Purifier Beam is fantastic. It'll force anyone you target to run away, often ensuring they can't do what they intended. Used on a Support, or Assassin with low mobility, it can be deadly. Variable: Supression Pulse provides a huge AOE blind that lasts 4 seconds is a huge amount of mitigation and when combined with your shielding, buys you and your team lots of breathing room. If against a melee attack, or basic attack heavy composition, grab this. Similarly to Solarite Reaper, Triple Strike allows Artanis to deal even more damage with Twin Blades hitting 3 times instead of 2. The only catch is you gain a 1 second additional cooldown. Great if you're after pure damage. Variable: Graviton Vortext allows Artanis to pull two targets with Phase Prism, while also lowering its cooldown by 5 seconds. For pure disruption of the enemy team, it can turn any team fight. Titan Killer allows Artanis' basic attacks to deal an extra 0.5% damage equal to a targets maximum health. When empowered with Twin Blades, this increases to 1.5%. Considering Twin Blades gains bonuses from Triple Strike, and Follow Through, it allows for a hefty damage increase. Variable: Psionic Wound is a fantastic alternative as it allows your team to aid you in bursting down a target. Although the vulnerability it causes is brief (2 seconds) it's often more than enough against a high value target. Providing some much needed mobility outside of Blade Dash, Zealot Charge effectively double's Twin Blades' charge distance, allowing you to leap towards opponents who think they're in a safe location. These Hero Threat Levels (1 being lowest threat and 10 being highest threat) are to help you determine which enemy Heroes can give you a headache. For the Heroes listed here, take extra care as they're particularly dangerous for Artanis. The Butcher: Lamb to the Slaughter combined with Butcher's Brand will absolutely destroy you. You've no means of getting away from him and his self healing is far superior to your shielding. Kael'Thas: Gravity Well can really ruin your play as Artanis. It'll stop Blade Dash instantly and leave you incredibly vulnerable - escaping afterwards really isn't an option. Jaina: She's a huge threat because of her ability to slow you. With no "outs" this leaves Artanis struggling to escape encounters and as a result, you'll be focused. Kerrigan: Considering you both have self shielding, Kerrigan usually comes out on top because of her elite but also her ability to interrupt you. You can also struggle to escape because of her pull. Leoric: Purely because of his self healing and ability to slow you, Leoric is a real nuisance that you'll never really be able to kill. This list of tips and tricks are just a handful of things we think will help your Artanis play. We'll continue to add to the list as required and if you have any tips you'd like to share, let us know in the comments below and we'll place them here. 1. Even though you're classed as a Warrior, you're fairly squishy. Don't just run into a fight first - you'll die. You're more of a bruiser who relies heavily on triggering your shielding. 2. Utilise Twin Blades as often as humanly possible. It'll allow you to boost your damage significantly. 3. Remember your Trait only triggers at 75% health. Before then, you'll quickly lose any health when focused unless you're being healed. 4. Blade Dash is a high damage ability but it also leaves you vulnerable. Only use it if you know you can't be disrupted or rooted. 5. Phase Prism has a very short range unless used with Twin Blades; be sure to use it when near an enemy. 6. Phase Prism can also travel through walls and barriers, allowing you to switch with an enemy who thought they were safe. 7. Always try to use Phase Prism on a squishy target and once you've swapped places, immediately turn around to block them whilst using Twin Blades. It's a wicked burst of damage. 8. Artanis has no reliable "out"; be sure to skirt around the edges of a fight when it first starts to pick your target effectively. 9. Try to use Supression Pulse when it can hit multiple targets - wasting it on one or two Heroes isn't ideal. 10. You have to keep using your basic attack on Artanis to get the most out of his trait. Don't stop hitting in order to cut time off its cooldown. Thanks for reading our Artanis build guide. You can help support its updates by subscribing to Ten Ton Hammer. Here's the details.